Dr. Jill Stein is facing a rematch with Mitt Romney when the Green Party’s national convention nominates her for president at a Baltimore hotel Saturday. The physician ran against Romney for governor of Massachusetts 10 years ago “in desperation” and “with low expectations,” she said in an interview Thursday. Stein, 62, a graduate of Harvard College and Harvard Medical School, said her focus had been working on the local and state level. She ran for several state and town offices, including another race for governor in 2010, but she had been “fairly disengaged from the national level” when she came to realize that that’s where the action needed to be. She was looking for someone else to be the Green Party nominee when she was persuaded to run herself. “The last straw was when I heard President Obama put Medicare, Social Security and Medicaid on the chopping block as part of his solution to the debt ceiling crisis,” Stein said. From his handling of the economy to health care based in insurance companies and the continuation of the wars he pledged to stop, Stein is no more a fan of Obama than she is of Romney. 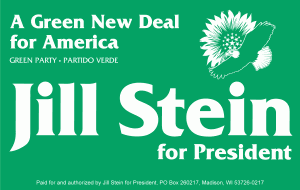 As Stein defines it, the 10-year-old Green Party is about “People, Peace and the Planet” and she would add Democracy. In February, she announced her “Green New Deal,” The platform features an Economic Bill of Rights that includes a full employment program “ensuring a job at a living wage for every American willing and able to work,” nationally funded but locally controlled. 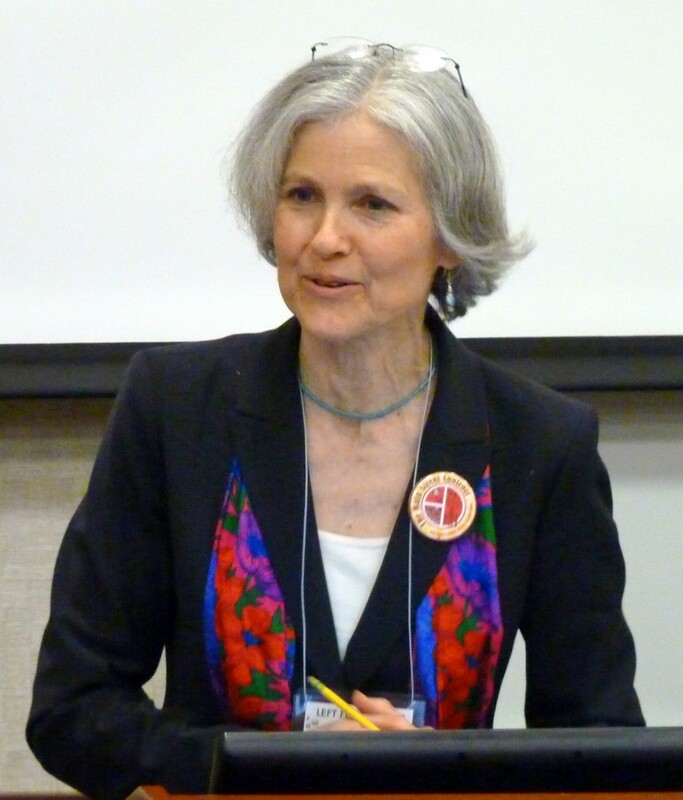 The Bill of Rights also includes a Medicare for All plan, with comprehensive care and no fees for delivery – Stein’s version of a single-payer system like Canada’s. Her program also includes tuition-free public education through college, affordable housing with a stop to foreclosures, and fairer taxation. Finally she wants a revival of a “real, functioning democracy,” that includes election reforms such as same-day registration, public financing and direct election of the president. Some of this sounds like proposals many people might support, but how do you pay for it? Simple, Stein said: Stop the wars, the Wall Street bailouts, the tax breaks for the wealthy and the health care boondoggles. Stein would cut one-third to one-half of the military budget, apply “a really tiny tax “– .03% — to every Wall Street transaction, “get the extremely wealthy to pay their fair share,” and eliminate the insurance companies administrative costs, which come to about 30% of the health care dollars. “When you add them up, that’s a huge amount of money,” Stein said. This all sounds pretty-pie in the sky for a minor third party that must struggle to get on the ballot in many states. Currently, Stein’s name will be on the November ballot in 20 states, with petitions being circulated in 19 others, including Maryland. “You don’t get there unless you start,” Stein said. “Hope is not a good political strategy. What we’ve learned is that the politics of fear has delivered all these things we were told to be afraid of ” — wars, erosion of civil liberties, jobs going overseas, declining wages. In American history, she said many successful social movements – such as the abolitionists, suffragettes and unions – were associated with independent third parties that helped implement the cause. “We are at a moment of incredible social upheaval,” Stein said. “We are in a very dangerous place right now” with the economy, jobs and the banking connections to Europe. “People are hungry for a real democracy that serves us … for an economy which is equitable. People want a solution that works.